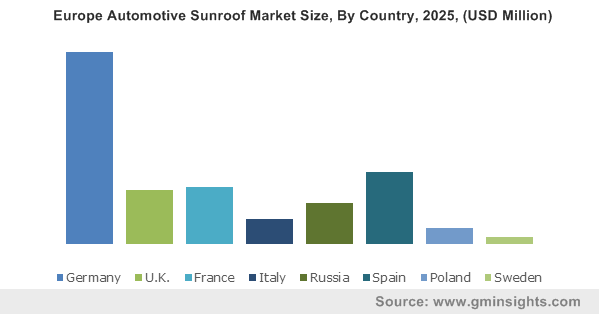 Automotive Sunroof Market size valued at over USD 21 billion in 2018 and is estimated to exhibit 10% CAGR from 2019 to 2025. Enhanced aesthetic appearance, better driving experience, and improved air ventilation are significantly contributing towards the automotive sunroof market expansion over the study timeframe. OEMs are engaged in developing advanced technologies to manufacturer sunroofs including composite materials for developing light weight sunroof solutions, thereby contributing to the increasing industry demand. 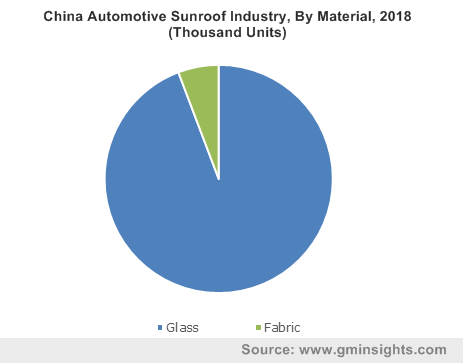 Rising preference for vehicles fitted with sunroofs along with proliferating vehicle production to cater the ever-increasing consumer demand are providing a positive outlook for the automotive sunroof market penetration over the study timeframe. Industry players are investing in R&D to develop lightweight sunroofs for reducing the overall vehicle weight to increase the overall vehicle efficiency. Increasing demand for SUVs and premium vehicles on account of rising per capita income, lower bank interest rates, and robust economic conditions are driving the automotive sunroof market share over the study timeframe. Automotive manufacturers are focusing on passenger safety features in their vehicles by introducing innovative features including sunroof airbag systems. Emergence of alternative fuel vehicles are enabling OEMs to develop solar cell sunroofs, thereby offering additional battery recharge and improved temperature control. Higher demand for passenger comfort and safety features in vehicles and rising requirements for improved visibility inside vehicles are boosting the market share over the study timeframe. Additionally, car manufacturers are introducing affordable vehicles with in-built sunroofs for combating the growing competition among industry players. However, high maintenance and integration cost and additional weight of the sunroof may hamper the market demand. Glass sunroof accounted for a significant revenue share in the automotive sunroof market over the forecast period. This can be credited to the advancements in glass technology that offers superior protection from ultra-violet rays. Further, wide range of glasses such as laminated glass and tempered glass with improved break and scratch resistance are providing a positive outlook for the industry expansion. Fabric sunroof will account for a considerable share in the market size over the projected timeframe. This share can be attributed to the rising preference of consumers to opt for glass sunroofs owing to improved aesthetics and premium ambience compared to the fabric sunroofs. Additionally, the improved protection offered by the glass sunroofs along with increasing sales of convertibles further limits the fabric sunroof market expansion. 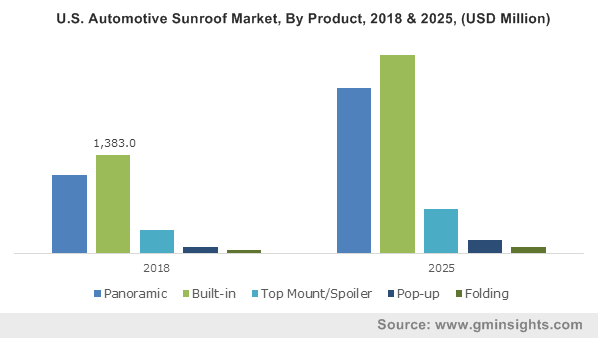 Panoramic sunroof will grow significantly in the automotive sunroof market share owing to increasing adoption of lightweight solution in panoramic sunroofs such as polyurethane and polycarbonate composites. Installation of these sunroofs in premium vehicles, along with dynamic line design, and usage of laminated safety glass are further expanding the segment growth. Built-in sunroofs will account for the highest volume share owing to the increasing adoption of such roofs by automobile manufacturers in their vehicle portfolio. The incorporation of tinted laminated glass along with sunroof shade offers superior protection from sun, thereby expanding the segment share. Moreover, the easier sunroof operation with one-touch buttons and switches further improves the product adoption over the projected timeframe. Automatic sunroof will register the highest growth owing to the development of soft-touch sunroof electronics with automatic operation and single touch buttons. The advancements in automotive electronics along with automated technologies are further supporting the segment growth from 2019 to 2025. Integrated safety systems that prevent sunroof closing during detection of an object and automatic rain sensors are further driving the automotive sunroof market share. Manual sunroof accounted for a considerable volume share in 2018. This share is attributed to the increasing adoption of these sunroofs owing to lower cost and easier installation process. The absence of any motorized tools along with the application of hand-based operation are further expanding the segment size. However, automobile manufacturers are focusing on incorporating automatic sunroofs owing to enhanced convenience features for consumers, that may limit the market size over the projected timeframe. OEMs accounted for a significant revenue share owing to the development of advanced sunroofs with wind deflectors and automatic switch technologies. Industry players are entering into strategic agreements and partnerships for expanding their market share. For instance, in September 2018, CIE Automotive announced the acquisition of Inteva Roof Systems that enabled company to enhance its global footprint in the automotive sunroof market. Automotive sunroof aftermarket will register considerable growth on account of increasing requirement of periodic maintenance of automotive sunroof owing to rising prevalence of vehicle accidents, along with the requirement for optional or removable sunroof. Further, rising prevalence of shattered sunroofs owing to improper heat dissipation and pressure build up are further expanding the aftermarket size. However, improvements in rubber bead technologies along with improving scratch & shatter resistant glass may limit the segment share over the study timeframe. Asia Pacific will register highest growth in the market share owing to increasing premium vehicles sales in countries such as China, India, Thailand and Japan. Additionally, governments in emerging nations such as South Korea, Thailand, and India are offering incentives to automotive manufacturers for increasing their automotive production. Moreover, foreign direct investments for establishing newer manufacturing factories across the region are further boosting the regional growth over the forecast timeframe. 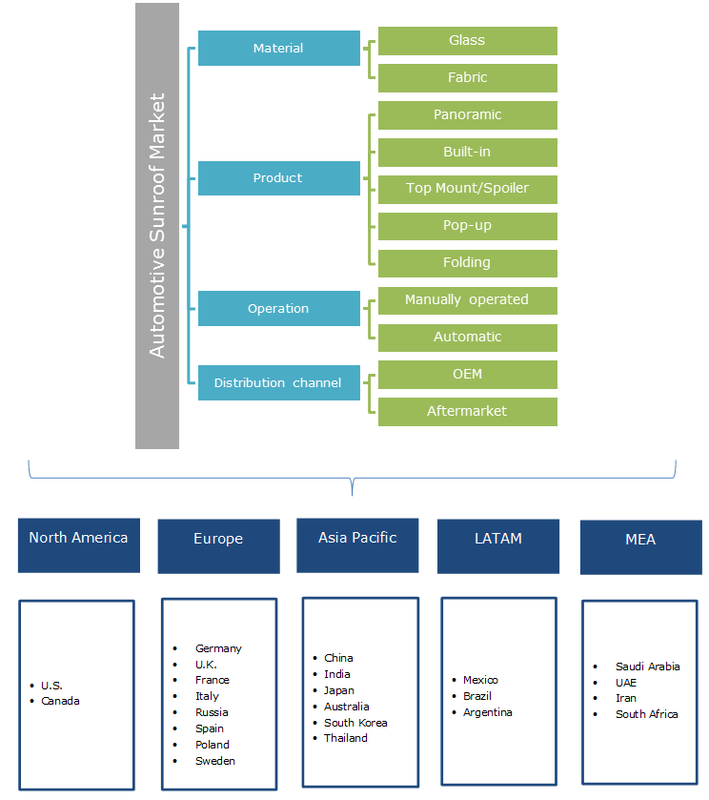 Europe automotive sunroof market place accounted for a significant revenue share in 2018. This can be credited to the presence of prominent carmakers such as BMW AG, Audi AG, and Daimler AG among others across the region. These manufacturers are continuously investing in R&D for incorporating solar sunroof in their cars for improving the electric vehicles efficiency. For instance, in August 2017, Audi AG announced the installation of glass sunroofs with solar cells that enabled company to offer improved charging capabilities for the car battery to improve efficiency. Major automotive sunroof market players include Webasto SE, Inteva Products LLC, Inalfa Roof Systems B.V., Aisin Seiki Co., Ltd., CIE Automotive, and Magna International, Inc. Industry participants are focusing on expanding their production capabilities for increasing their business share. For instance, in May 2016, Inteva Products, LLC announced the opening of its new manufacturing plant for automotive sunroof in Romania. Additionally, the company also announced its plans to cater to the growing consumer demand for sunroofs in the European region. Industry players are developing innovative lamination processes that contribute towards offering reliable and strong sunroofs with superior break and scratch resistance. Additionally, industry players are also focussing on introducing lower weight and thin sunroofs that contribute positively towards improving the overall driving experience. For instance, in 2014, Webasto developed tear-resistant polyethylene terephthalate film enabling improved sunroof safety and protection from shattering. Moreover, automotive manufacturers including McLaren and Mercedes are incorporating advanced technologies including electrochromic systems for introducing lower cost sunroof solutions for its vehicle portfolio. Rising demand for automotive sunroof from regions such as North America and Europe due to higher consumer spending on premium vehicles is further strengthening the market size.